The woolen factory at Dayton produced many different products. Cassimere was a closely woven twilled fabric. It had a smooth surface and was used for suits. Jean was not the same fabric as denim in the 19th century. Topcoats, vests and jackets could be made of jean in different colors – black, blue, or white. Denim was used for work clothes worn by manual laborers, while other workers would be dressed in tailored trousers made of jean. Although the two fabrics were similar, denim was made with one colored thread and one white thread; jean was woven of two threads of the same color. Sock yarn could be had in a light mixture or in a blue grey. Carpet yarn also came in assorted colors. Blankets (white, grey, or multicolored) and buggy rugs were available to keep out winter’s cold and wind. Carpet was made in a number of styles and flannel could be purchased in white, scarlet, grey striped, or black and white check. 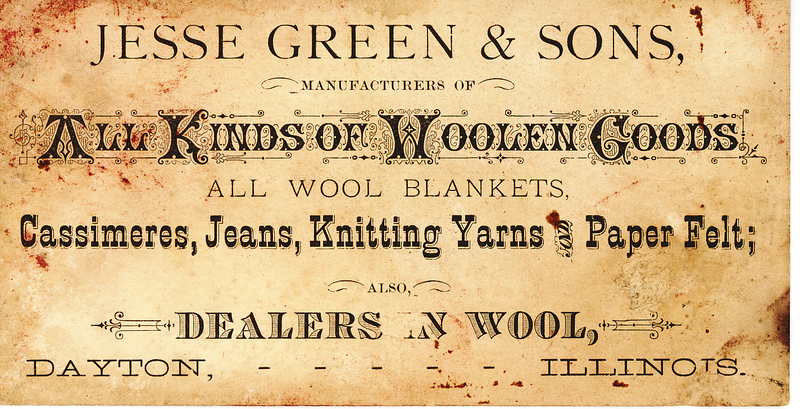 Other varieties of cloth included satinett (half wool and half cotton, but finished the same as wool); doeskin (a twilled fabric that came in different weights); linsey (a strong, coarse fabric with a linen or cotton warp and a woolen weft); and tweed.